Workers come in all shapes and sizes, from eager interns to those coasting their way through the week. These workers all contribute at different levels, even when their compensation is similar. To ensure that the business is getting the most from its employees, HR partners have to identify and attract the performers that drive success. Fortunately, there’s a CIPD framework to help you with doing just that, which breaks down different types of worker into quadrants. The most sought-after employee is the Thinking Performer: a person who has the attitude, aptitude and skills to really succeed. Join us as we identify this type of worker and teach you how to support their growth. The Thinking Performer exists on a matrix of personality types that categorises workers based on two traits: efficiency and effectiveness. Put simply, efficiency describes how much work a person gets done, while effectiveness describes how good a person’s work and results are. In other words, it’s a way to show both the quantity and quality of someone’s contribution to the business. As both efficient and effective workers, Thinking Performers are the complete package; they take the initiative, follow through with timely action, and are successful in achieving their goals and targets. Others on the matrix have some of these qualities, but not others. This includes the likes of the Wishlist Dreamer. These individuals have the potential to produce high quality work and often come up with great ideas, but lack the skills or motivation to execute their plans efficiently. On the opposite end of the scale, we have the Automated Bureaucrat. They complete all their assigned tasks consistently (and almost robotically), but they won’t go the extra mile or bring fresh ideas to the table, limiting their effectiveness. Inverse to the Thinking Performer, you’ll find the Lifetime Liability. Unlike the Wishlist Dreamer and Automated Bureaucrat, they don’t have efficiency or effectiveness on their side. These employees are sometimes referred to as ‘dead weight’ as there are few competencies to build on. Of course, no one fits exactly into these personas – most people fall somewhere in the middle, and develop their efficiency and effectiveness with time. Anyone can become a Thinking Performer with the right attitude, ambition and support. The Thinking Performer doesn’t just accept current processes as they are, they actively look for ways to improve them. They ask questions about why the process is a certain way and how it could be more efficient or successful. Those in charge of managing Thinking Performers must be willing to listen to their ideas. Creating a culture in which the Thinking Performer can ask questions and make suggestions without judgement is essential for their development. If the manager is unable or unwilling to deal with questions and suggestions, they’re not providing a nurturing environment for their Thinking Performers. This can lead to disengagement and even turn Thinking Performer might turn into an Automated Bureaucrat – a great professional loss for both the employee and the company. To put their ideas out there, the Thinking Performer must have a degree of confidence. This can be something inherent that they’ve brought to the role, or their confidence may be gained through experience and learning. Some apparent Automated Bureaucrats can be encouraged to become Thinking Performers by working on their confidence levels; they may simply be too shy to voice their ideas. This is not an overnight process, however, and it’s up to HR and their line manager to help them to grow. Confidence can come from additional training, team days, positive performance reviews, awards, and regular feedback. As well as these more formal check-ins, you can also have informal encouraging chats to boost the confidence of employees. Encourage line managers to give feedback to employees frequently; as long as it’s constructive, even negative elements can be turned into an opportunity for growth. If line managers don’t have the skills to give feedback constructively, more training and feedback may be useful for them. Mentoring also offers a great opportunity for employees to develop confidence. Having an assigned and trusted connection to bounce ideas off will make employees more likely to put their ideas forward in a group setting. Being able to communicate with others and effectively explain ideas requires social prowess. While personalities don’t always mesh together in every workplace, the Thinking Performer can find ways to connect with others. You’ll also find that a lot of Thinking Performers have a natural talent for networking. They appreciate that careers are built upon their relationships with others and take care to curate a supportive network. Through networking with others, they can also identify other areas in which they can contribute. Far from just paying attention to what’s right in front of them, they use these connections in other departments and companies to gain new insight into the challenges they’re facing. This can greatly benefit the organisation, as fresh eyes on a problem can assist in finding a suitable solution. While you can teach employees many different skills, you can’t force them to change their attitude. This is an individual challenge which can be influenced by a range of factors. The Thinking Performer tends to have a responsible and outgoing attitude; nurture this by promoting a positive working environment. On the flip side, some employees may arrive in a company with a fantastic attitude and find this eroded by a poor working environment. This is an observable shift, as workers become less engaged and dedicated over the course of their employment, often leading to lateness, absenteeism or conflict. If there is an overall culture problem causing poor attitudes, then HR should address this. Identify the main problem: are your employees suffering due to overwork, long hours, toxic colleagues, mismanagement, lack of training, poor communication between departments? Once you’ve identified the problem, design a strategy to combat it. Benefits such as an increased salary, wellness initiatives, benefits and perks, and flexible hours can make the workplace much happier overall. An employee survey will help you identify key problems and solutions. In addition to thinking outside of the box, Thinking Performers must be flexible enough to implement their grand new plans. This may include working outside of their usual job role or taking the initiative to communicate with other departments. Some employees have been trained to be rigid within their job role – we’ve all heard the old gem “that’s not in my job description”! If an employee has come from a rigid workplace, they may require encouragement to display this flexibility. Bear in mind that flexibility should be beneficial to both parties. If you want the employee to trade in some of their time, then you should be willing to incentivise them. If they take the initiative to stay late to work on a new task, then some flexibility around working hours should be considered. Remember, it doesn’t take much to ruin this mindset within an employee! If they perceive the exchange to be unfair or one-sided, they won’t be likely to volunteer their talents in the future. Employees should also show an ability to prioritise their own tasks with ones that they’re helping out with. While a task from another department may seem like a novelty, they no doubt have processes that are deadline-dependent in their own role. Careful coaching should help them to be aware of this. Now that you know who your Thinking Performers are, put a plan in place to retain them. So, what does rewarding these outstanding employees look like? Immediately you might be thinking of promotion and pay, but every employee is different. The rewards that you offer should be as individual as the employee, who you should get to know over time. This is where staff reviews and check-ins can come in handy. If you know the employee and their ambitions, then you’ll be better equipped to offer them what they’re looking for. For example, if you know that the employee prefers one aspect of their job to another, you could consider delegating this task to another member of staff and growing their other responsibilities. Moving the member of staff laterally can also form a key part of your succession planning function. Identifying these employees for future management can act as an incentive to stay in the company. 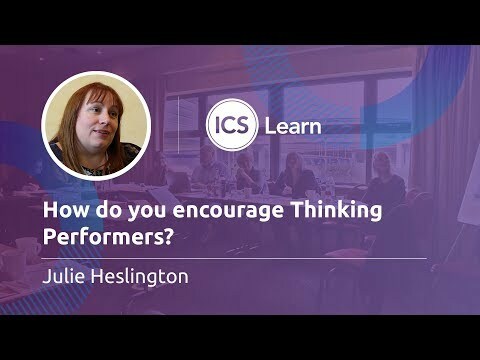 Remember: Thinking Performers are an asset, but if you don’t develop and train them, they can slip down the matrix to a less desirable position – or slip away altogether. Support your Thinking Performers with an online course that fits around their workday.